When the Multi Channel oscilloscope software is started, all locally connected supported instruments not in use by other applications will be detected. When only one instrument is found, it will be opened automatically. When more supported instruments are detected, the Open instruments dialog is shown with the detected instruments. To open an instrument, place a check in the checkbox for that instrument. The checked instrument(s) will be opened when the dialog is closed using the OK button. Removing a check will close an already opened instrument. The toolbar in the dialog gives access to additional functionality regarding selected instruments. Instruments can be slected by clicking them with the mouse, when more instruments need to be selected, keep the Ctrl pressed as well. To update the list of detected instruments, the Refresh button or function key F5 can be used. To show detailed information of the selected instrument, click the Info button. This will show a dialog with instrument name, serial number, calibration date, driver version etc. The software supports combining multiple instruments to a large combined instrument. When the instruments have a CMI interface, this combining is done automatically when the instruments are coupled to each other via the CMI interface when the software is started. Only the combined instrument will be listed in the dialog. When the instruments do not have a CMI interface, combining them must be done manually. To combine these instruments, select them by clicking them with the mouse having the Ctrl key pressed. Clicking the Combine button will then combine the instruments. The instruments also need to be connected using a special cable, read more about manually combining oscilloscopes. When a manually combined instrument (consisting of instruments that do not have a CMI interface) is listed, it can be split up into individual instruments again by selecting the combined instrument and clicking the Separate button. Using the TPISS Instrument Sharing Server, TiePie instruments can be accessed via a network. When an instrument is connected to a computer in the network running the Instrument Sharing Server, the Multi Channel oscilloscope software can access, open and use the instrument from a different computer in the network. To open a network instrument, enable Search instruments in the local network in the Manage instruments dialog. That will scan the local network for computers running the TPISS and will show the connected instruments on these computers. Connected instruments that are in use by another application will be listed as Not available and can not be opened. To open an instrument, place a check in the checkbox for that instrument. The checked instrument(s) will be opened when the dialog is closed using the OK button. Removing a check will close an already opened instrument. 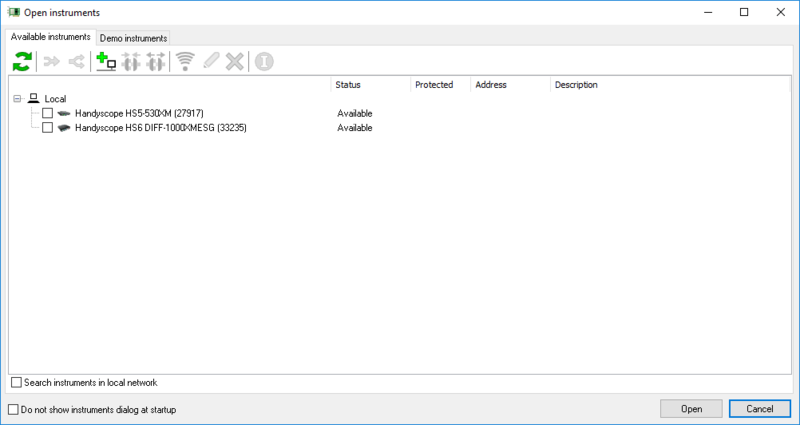 The toolbar in the dialog gives access to additional functionality regarding the detected network instruments. When a computer running the TPISS Instrument Sharing Server is not located in the local network, it will not show up in the dialog by default. Use the Add network location button to add its location to the list of searched network locations. The network location can either be entered as IP address or as host name. 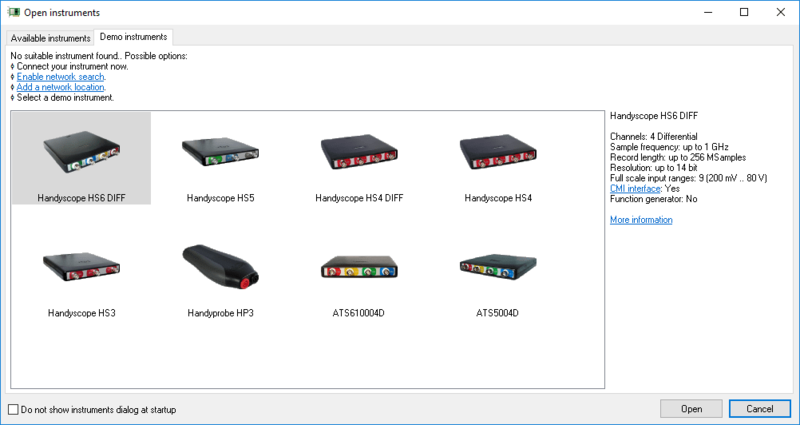 When Connect automatically is checked, the Multi Channel oscilloscope software will automatically connect to the remote server and show its connected instruments. The location will also be added to the list of used locations. Editing this list can be done via the program settings. 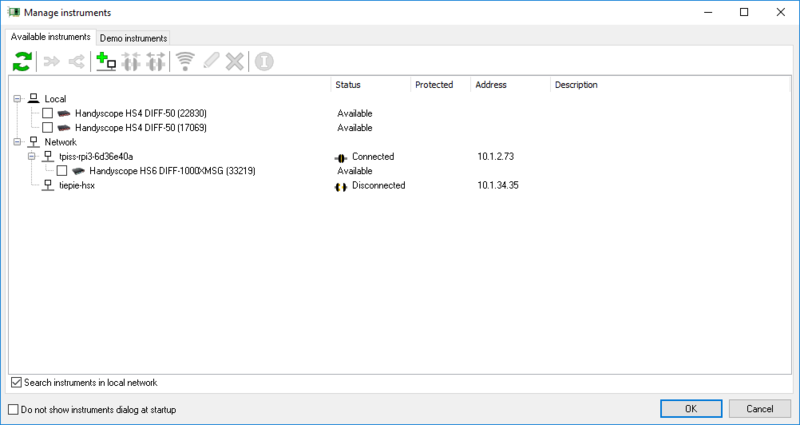 To connect to a listed remote server, select the server by clicking it with the mouse and then click the Connect button. The Multi Channel oscilloscope software will connect to the server and list all connected instruments to that server. When network notifications are enabled, these will be shown for the connected server(s). To disconnect from a connected remote server, select the server by clicking it with the mouse and then click the Disconnect button. The Multi Channel oscilloscope software will disconnect from the server and no longer list the connected instruments to that server. Notifications for the disconnected server are no longer shown. When a remote server is connected to the network via a wire and it also has the possibility to connect to the network wireless using WiFi, the server can be instructed to connect to the WiFi network by selecting the server and clicking the Setup WiFi button. 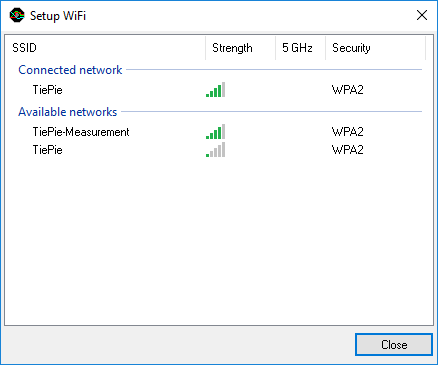 This will open a WiFi connection dialog in which the available networks are shown. To connect to a WiFi network, double click it, which will open a dialog to enter the WiFi network password. After that, the server will try to connect to the WiFi network, after which the cable can be removed. To disconnect from a WiFi network, double click the connected WiFi network, which will open a confirmation dialog for disconnecting from the WiFi network. When the IP address or host name of a manually added network location has changed or was entered incorrect, it can be edited by selecting that network lcation by clicking it with the mouse and then pressing the Edit button. When a manually added network location is no longer required, it can be removed from the search list by selecting it with the mouse and clicking the Delete button. When no supported instrument is detected, the Open instruments dialog is shown with a demo instrument selection, showing all available demo instruments and their key specifications. The required demo instrument can then be selected and will be opened when the dialog is closed using the OK button. When more than one Handyscope is opened, one oscilloscope will be active, indicated by a blue and boldface name in the Object tree. Oscilloscope specific Hotkeys will apply to the active oscilloscope only. A different oscilloscope can be activated by clicking it in the object tree or by pressing the corresponding Hotkey. Controlling oscilloscopes and channels can be done by means of toolbars. A fully configurable oscilloscope toolbar is available for each oscilloscope. For each channel also a fully configurable channel toolbar is available. Controlling oscilloscopes can also be done by right-clicking the oscilloscope in the object tree. This will show an oscilloscope popup menu with all settings of that oscilloscope. Channels can be individually controlled by their channel popup menus which are opened by right clicking the channel in the object tree. Read more about controlling with popup menus. Read more about oscilloscope toolbars. Read more about channel toolbars.